Tom Verducci of SI.com put together his individual and team awards now that baseball is at its halfway point. Below are some of his team awards. AL Biggest Surprise: Texas Rangers. The team with four straight losing seasons has never been more than 3 1/2 games out of first place all season. Kevin Millwood has been a true workhorse and ace for a pitching staff that has held up very well under coach Mike Maddux. NL Biggest Surprise: San Francisco Giants. They might not even hit 100 home runs and they might be the least patient hitting team in the league, but the Giants are a legitimate wild card threat because their pitching is spectacular. AL Biggest Bust: Cleveland Indians. Yes, injuries have helped take this team out of contention, but the Indians shouldn’t be this bad. The bullpen has been frightening. NL Biggest Bust: Arizona Diamondbacks. Suddenly, they are a stagnant organization, and the A.J. Hinch hiring as a completely inexperienced manager has looked about as risky as it sounded at the time. AL Best Plan A: Detroit Tigers. 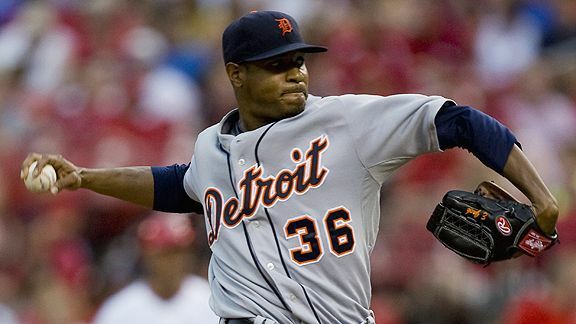 They fast-tracked Porcello, traded for Edwin Jackson, moved Brandon Inge to third, acquired Gerald Laird and Adam Everett and paid Gary Sheffield to go away, a symbolic move that the organization knew the team had grown too old and unathletic. The emphasis on pitching and defense has been spot on. NL Best Plan A: Los Angeles Dodgers. They cut their payroll by $18 million and wound up with the best record in baseball. The Orlando Hudson signing was a gem, not to mention those of Casey Blake, Mark Loretta, Brad Ausmus and Randy Wolf, gamers all. AL Worst Plan A: Oakland Athletics. Oakland does a nice job of collecting assets on the cheap, but the plan doesn’t seem to come together. Old horses Jason Giambi, Orlando Cabrera and Nomar Garciaparra have 729 plate appearances and OPS+ marks of 92, 69 and 83. Matt Holliday isn’t as valuable now as when Oakland acquired him. And the Athletics continue to have major problems keeping players healthy. Oakland does have a bunch of good arms that could pay off big soon, and there’s still time to invoke a good Plan B before the trade deadline. NL Worst Plan A: Washington Nationals. Why is Adam Dunn here? The Nats have too many outfielders who are poor defenders, too many starting pitchers who can’t go deep enough into games, too many relief pitchers who can’t get enough hitters out and too many dumb mistakes.